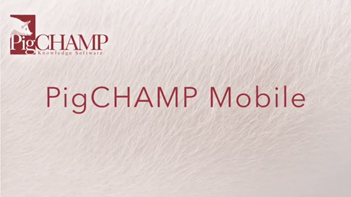 PigCHAMP has a number of customizable features that allow you to collect, enter, track and analyze the data that is important to you and your business. 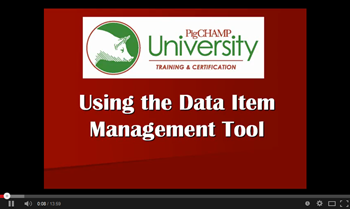 In this Did You Know tutorial, we'll focus on how to add custom data items to data entry screens and some PigCHAMP reports - a feature unique to PigCHAMP called Data Item Management. Data Item Management gives the user the ability to define what fields appear on screen, and the order in which they appear for each data entry event and create user-defined data entry fields. Find out more in your products Help Files, on our FAQ webpage, or watch this youtube video. In an independent trial, PigCHAMP Mobile was found produce significant savings in both time and money - time spent entering data was reduced by one-third, with an annual saving of $1.42 per sow. With added benefits like improvements in data accuracy and having real-time data available to make on-farm management decisions, using PigCHAMP Mobile is a great investment. PigCHAMP is part of the Farms.com family of companies. Farms.com offers farmers and agri-business an on-line portal to information about farm markets, real estate, used farm equipment, message boards and farm news. Newsletters delivered right to your inbox will ensure you have the most up-to-date information right at your fingertips. Visit us at www.farms.com for more information.